Albert Einstein did not believe in a personal God. And his famous quip that “God does not play dice with the universe” was a statement about quantum physics, not a statement of faith. But he did leave behind a fascinating, largely forgotten legacy of musings and writings – some serious, some whimsical - about the relationship between science and religion and his own inquisitive reverence for the “order deeply hidden behind everything." Einstein’s self-described “cosmic religious sense” is intriguingly compatible with 21st Century sensibilities and will be the starting point for a discussion between Krista Tippett and Andrew Solomon, instigated by Paul Holdengräber. Andrew Solomon has argued that science and humanism are two different vocabularies for a single set of phenomena, and that understanding order through the laws of mathematics and understanding order through faith in life's underlying purpose are really an identical exercise. 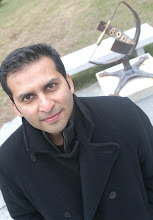 Solomon is one of the thinkers in Tippett’s book, Einstein's God: Conversations about Science and the Human Spirit, which draws on her radio conversations to explore an emerging interface of inquiry – if not answers - between many fields of science, medicine, theology, and philosophy. Krista Tippett is a Peabody-award-winning broadcaster and author. As t he creator and host of Speaking of Faith at American Public Media, she has innovated a new model of intelligent, in-depth journalism about religion and spiritual ethics in every aspect of human endeavor. The program is heard on over 200 public radio stations across the U.S. and globally via podcast and Internet. She is the author of a memoir and reflection on religion in 21st Century life, Speaking of Faith: Why Religion Matters and How to Talk about it. Tippett's most recent book, Einstein's God: Conversations about Science and the Human Spirit is centered around her conversations with scientists both religious and non-religious, including Freeman Dyson, Janna Levin, Mehmet Oz, Sherwin Nuland and others. For more information, check out this website. 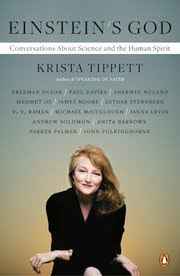 I wish I could go -- Krista Tippett is a great interviewer. I'm sure this will be very interesting!